PokerStars Makes Millionaires promotion delivered more than $12.5 million in just eight weeks, transforming eleven players’ lives. The promotion brings the total number of poker millionaires created by PokerStars to 208. Top prize won by SCOOP High Main Event champion Charlie Carrel. The Englishman topped a field of 693 players to win $1,200,899.97 from the $6,930,000 prize pool. The PokerStars Championship Sochi RUB 318,000 Main Event was won by Pavel Shirshikov for RUB 29,100,000 ($514,895) who beat Russian High Roller Vladimir Troyanovskiy heads up to conquer a field of 397 players on home soil. Total guarantee for PokerStars Festival Manila is PHP 24,000,000. The event will be held at the ‘PokerStars LIVE at City of Dreams Manila’ from July 28 to August 7. The event boasts an 11 day schedule of 56 tournaments. Satellites for the Main Event run until July 23 including seat-only (worth USD $1,130) and seat-plus-hotel accommodation (worth USD $1,944) packages. The total amount PokerStars Festival Korea is guaranteeing in its flagship PokerStars Open event. The debut PokerStars Festival in Asia will take place at Paradise City, Incheon complex – the newest luxury gaming resort in the country – for an 11-day schedule of 34 events. Highlights include the KRW 1,650,000 buy-in PokerStars Festival Korea Main Event and the KRW 4,350,000 buy-in PokerStars Festival High Roller, as well as exciting new tournament such as the KRW 660,000 buy-in PokerStars Super Deep event. Satellites will run until July 9 including seat-only qualifier packages worth USD $1,507 and seat-plus-hotel packages that have a value of USD $3,363. Local boy 25-year-old Christopher Franco won his first live title for $97,360 in the $500,000 guaranteed PokerStars Festival Chile Main Event. Newly-signed PokerStars and BetStars ambassador Stephen Hendry has spoken about his love of the game, his poker skills, and his legendary snooker expertise in a new video. The seven-time snooker World Champion is a keen poker player and will make his first official appearance at PokerStars Festival Marbella, which takes place from June 19-25. 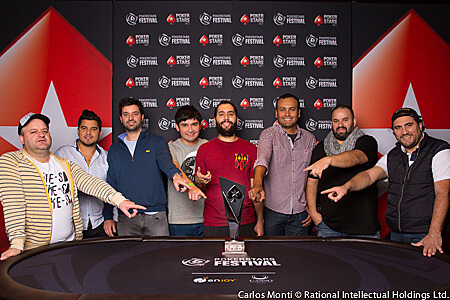 An impressive 14,176 players registered for the PokerStars Festival Marbella freeroll. The overall winner won a Main Event seat, seven night hotel stay and €350 expenses. The four bounty winners who knocked out Team PokerStars members Lex Veldhuis, Jake Cody and Marcin Horecki along with professional snooker player Stephen Hendry in the freeroll were awarded with a Main Event seat and €400 expenses. PokerStars Festival Marbella takes place from June 19-25 and will be attended by Veldhuis, Horecki, Fatima Moreira De Melo and Stephen Hendry. Players can qualify for the event via satellites currently running on PokerStars.